Looking for some help. We have this one spot in our pool that has shown up. It's very hard and does not come off with brushing. We haven't been in the pool yet to try taking a razor blade to it or anything but we have tried scrubbing it with the brush and with our fingers. Any ideas? We brush the pool and test weekly. It's calcium scale from the stacked stone above it. 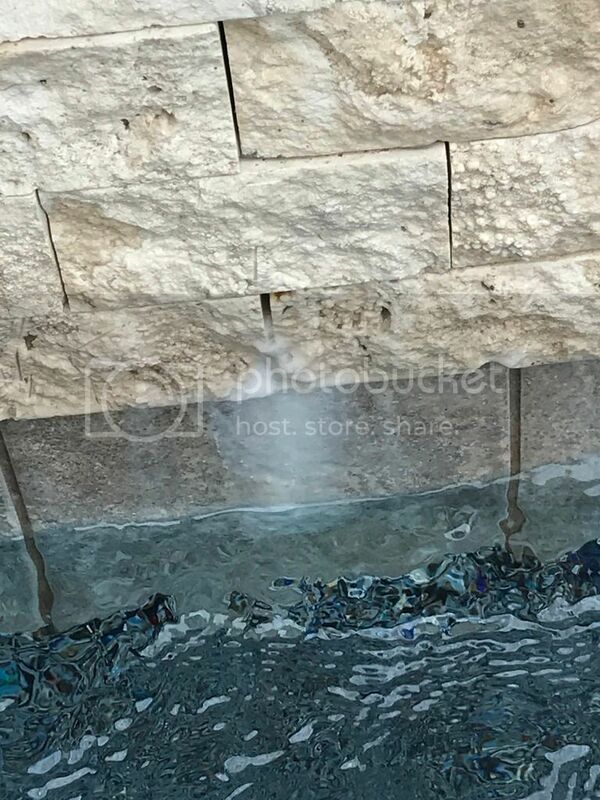 I get an exact same spot near my waterfall as water runs over the stones and then down some mortar before leaving the exact same sized white patch you have. There must be a slow drip of water coming from the gap in the stone there; some kind of penetration/permeation. Actually, looking at the wide angle shot, the water is migrating from the spa spillway. It's probably travelling along the grout lines of the various stones and just dribbling out at that point. It's probably not even noticeable. Could she put a dab of something to stop it from coming to that area? No you are just telling real life Matt. Better she knows and maybe can find a way to fix it or learn to live with it. That's one of those situation where the "cure" might look worse than the "disease". Someone with way more skillz than me might be able to grind out that scale and then fill the gap with a carefully selected silicone or urethane caulk to match the color perfectly....me, I left my calcium patch in place and just consider it a birthmark....my OCD is trained on other things at the moment. Joyfulnoise, what is the negative of removing it with muriatic acid? Damage/discoloration to the surrounding stone work. Loosening or removal of the tile grout. And just the general hazard of messing around with acid (WEAR EYE PROTECTION!). Other than that, it can be removed. I do believe there's a scale removal gel, has the consistency of thick toilet bowl cleaner, that the pros use. HOWEVER, you have to be really careful to not let that stuff dribble down the and hit the plaster as it can discolor and etch plaster. It's thick and viscous so it doesn't readily dissolve. I believe it's a mixture of muriatic acid, phosphoric acid and hydrofluoric acid. Very corrosive stuff but it does the trick. The other non chemical option is kierserite blasting (a form of soda blasting) but that requires a specialist. It's a brand new pool and was only open one month last season. Our water stays well balanced. Is this just a common problem with that type of travertine? We still have some warranty work that needs to be done. Is this something the PB should be responsible for? It's not a matter of pool age or how well balanced the water is. The chemistry of the water that runs down the face of those stones and infiltrates it's way through those stones is drastically different than the bulk of the pool water and will always have a much higher scaling potential. The water simply absorbs lots of calcium out if the stone and mortar and becomes very prone to depositing scale. You're going to eventually see the same thing happen to the waterline tile at the water level - bath tub ring. There's no getting around it, all you can do is slow it down by keeping the chemistry as balanced as possible. This is just the nature of plaster pools with lots of stone work. 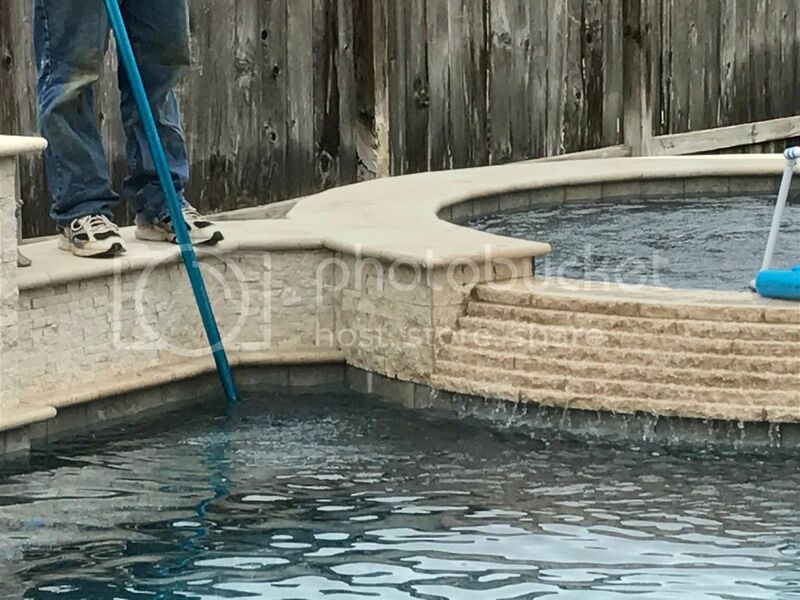 Typically speaking, you'll need to factor in professional tile cleaning every few years or so (figure about $3-$5 per linear foot of pool tile). Believe it or not, "Mr. Chemistry" here had to have his tile cleaned in year 2 of its life (because I got lazy one winter and let my pH get way too high). As for your builder fixing it...no harm in asking, I suppose. We have the exact same thing. Just use elbow grease. It's there all the time and with dark tile it really stands out. Need upgrade ideas for my new Intex! !